Put the whole orange in a pan with cold water, bring to the boil and cook for 2 hours, or until soft. Drain. When cool, halve the orange and remove big pips. Pulp everything in a food processor. Preheat oven to gas mark 4 (180c). Add the eggs, baking powder, sugar, bicarbonate, almonds and cocoa to the orange in the processor. Run until you have a cohesive cake mixture. 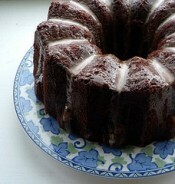 Pour and scrape into a buttered, 20cm springform cake tin and bake for 1 hour.